Image | June 26, 2017 June 26, 2017 | a love letter to rome and italy! Are we, the west in 2017, are we “Rome”? Yes! Yes and no. It depends on how you view Ancient Rome and how you view the west now. There is no easy answer. After this course I can understand more and more why a pagan would adapt this religion to aid his war success, and to be a unifier of an already somewhat fractured people. Tom Holland recently wrote about returning to the church after realizing in writing about the ancient Roman era for years, and about the Medieval, and the Renaissance periods, he saw more and more how Christian thought shaped much of our ‘modern’ form of humanism. Discovering remnants and fragments and sometimes entire pieces or histories of dug up Greco Roman art and philosophy in the Middle Ages and the Renaissance was an intellectual and spiritual goldmine for learned men, often monks, and eventually for wealthy woman patroness like Isabella d’Este or Lucrezia Borgia or Caterina Sforza or female artists like Sofonisba Anguissola, Lavinia Fontana or Artemisia Gentileschi. A great patron and nearly empirical statesman of Firenze, the infamous Cosimo de’Medici, installed the first “open” humanist library in a monastery for Florentine scholars and students, commissioning prints of works from classical antiquity, contemporary Humanist Catholic writers, and artworks with religious and classical themes. It was the first library not exclusively for ascetics or royalty in Europe in 1,000 years. The Ancient Romans in the late western empire and in the eastern empire, had to adapt to a new increasingly popular religion to survive, to become yet another new “old” Rome in an eternal city which had always extended itself to the farthest reaches of the earth, with a distinctive calling card, and yet was nevertheless as mutable as the water coursing through the aqueducts… Ancient Rome had to keep something from the past alive, and also they had to grow along with it and the times in order to still thrive in this rapidly flowing world. As far as why Rome “fell”, it also appears to me to be for a variety of reasons, and yet Christianity, I don’t think, is one of its downfalls. In darker moments I think we are the new Rome, then I remember Rome didn’t necessarily fall the way I thought before this class, that I can still walk among the ruins in the eternal city today, I can see the rituals, and even hear pieces of the language in an old church, and I can even see faces which remind me of a 2000 year old fresco… in the cafes. For every doom and gloom scenario for Europe or the US, and other parts of the west, there is a twist and turn, an adaptation or rejection, a battle or a war, and I think we are a long way off from either a surrender or a fall. 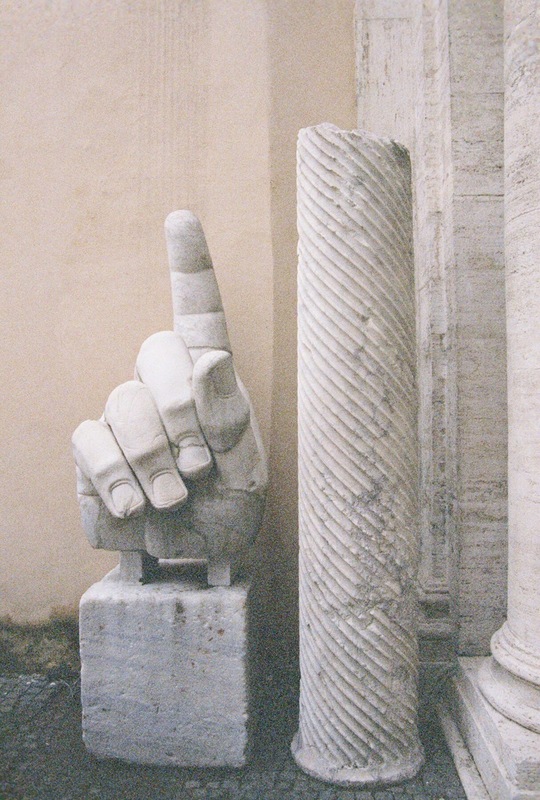 Reblogged this on a love letter to rome.